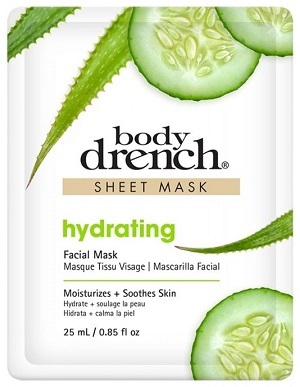 Body Drench Hydrating Facial Sheet Mask, Single Use Packet, .85 fl. oz. Aloe Vera has antimicrobial properties and provides a soothing effect. Cucumber hydrates, adds moisture and helps achieve an even-toned glow. Suitable for sensitive or irritated skin. Moisturizes skin so that complexion looks revitalized and radiant. How To Use: Remove mask from the pouch, unfold and apply onto dry, clean face. Leave mask on for 15-20 minutes. Remove mask and discard after single use. Massage remaining serum into face and neck. Use Brightening Facial Sheet Mask twice a week.